Chasing or leading, the 25- year old world No 1 is so confident in his ability as he chases his third win in a row and his fourth title from his last 15 majors starts that it's almost certain that he will respond at will to anything that's throw at him. As European Ryder Cup skipper Paul McGinley said of a day when McIlroy didn't play his best, found himself in a five-way tie for the lead at one stage before easing clear with a "steely" finish: "We all know how well Rory McIlroy can play but he's now showing that steely streak. That's what Tiger had. "You take Rory's game and add that extra flavour of steeliness, that ability to just push away, that ability to still shoot 67 when he's not on his game, that's what's going to make him great." Three birdies in the last four holes for a four under 67 gave McIlroy a one-stroke lead over the Austrian Bernd Weisberger on 13 under par in a display that was arguably more impressive than any of his perfect rounds. This was scrappy and ugly at times but when things got tight, he found the shots (and the putts) to separate himself. "I feel like I'm really confident right now no matter who is on that leaderboard, I feel like I have a pretty good chance in beating them," McIlroy said after birdies at the 15th (20 feet), 16th (171-yard none iron to a foot) and 18th (eight footer after a bunkered five iron approach to the par-five) left him in a familiar spot — out in front. Sure, there were a few wobbles from the man Jack Nicklaus believes can win 15 or 20 majors, if he feels like it. But there was never a sensation that the pride of Holywood was anything but in control despite being forced to hole an 11 footer for par at the driveable fourth after he'd been forced to go to the drop zone after double crossing himself and pulling his tee shot into a hazard. Fit as the proverbial butcher's dog, the looks like an 1,500m runner who moves effortlessly to the front at the bell. He has such a finishing kick that and such a classy stride that you can already see him galloping off towards the history books somewhere in the back straight. Sure, Wiesberger is a lovely ball striker, as he showed in carding an immaculate 65 to get to 12 under par. But with a best finish of tied 65th (last year at Muirfield) to go with four missed cuts in five major starts, it would be a miracle if he beat McIlroy on Sunday and won. Even with Rickie Fowler (67) two behind and Jason Day (70) and a battling Phil Mickelson (67) three adrift, you feel that McIlroy can respond to anything that's thrown at him. Nine players outscored McIlroy on Saturday but only Wiesberger was near the top of the leaderboard. Four behind are Louis Oosthuizen, Henrik Stenson, Mikko Ilonen and Ryan Palmer but while all four are capable of shooting the lowest round in the history of the majors — 62 — you feel that McIlroy would have little trouble producing a 66 given his current form. "Really happy with how I finished; to shoot another 67 without really having some of my best stuff for the round was really pleasing," McIlroy said ominously. Later he added: "I haven't it has not been quite as good as I can be. If everything does click tomorrow, then obviously I feel like there's a very low score in me. I'll take sort of scrapping it around in 67 if it puts me in this position again." Looking at the scoreboard, it would be tempting to think that this is a dogfight compared to the triumphal marches he's enjoyed at Congressional, Kiawah Island and Hoylake. That would be true if we were talking about the McIlroy of old. But this is McIlroy at his best and you sense that he will continue to improve. Much is made of his driving, and rightly so. But it's his putter that has made all the difference this summer. We've seen driving exhibitions of this ilk many times in the past. But through either poor course management or poor putting, or both, he didn't convert as often as he should have. Having wondered what might happen if he ever found a consistent putting stroke, we now know. McIlroy didn't need to be told he one-putted his last 12 greens yesterday. "Yeah, that was big," he said. "I was actually counting up how many putts I had today going down the 16th I think. I think I had 21 to that point, so I had 24 putts; 24 putts is a good performance out there. "Yeah, I felt really comfortable with the putter for the last, maybe the last couple of months. I worked on a couple of things after the Masters and it really seems to have clicked. It was a big putting round out there. There's a lot of putts that sort of kept the momentum of the round going." Having seen him win many a matchplay dogfight in his amateur days, there is no question that McIlroy has that side to him, despite so many runaway victories. If someone beats him on Sunday, they will have played superbly because barring what would be a surprising collapse because of mental or physical fatigue, McIlroy will not be going away. McIlroy's post round media interviews were revealing but he was more succinct on Sky Sports when speaking to Sarah Stirk after his 67. Clearly frustrated by some elements of his play — "It felt like every time I made a birdie, I made a bogey," he said of a six-hole stretch in the middle of his round — he was just as clearly delighted to respond to birdie runs by Fowler, Wiesberger and Mickelson late in the afternoon. "I am really happy with how I finished again," he said, pointing to the 20 footer for birdie at the 15th and the tap in birdie at the 16th as key. "It gives me a lot of confidence going into tomorrow that if I do get challenge and people do start to put the pressure on, I am able to respond to that really well, like I did today. I am in the position I want to be in going into the final round and just need to keep playing the way I am playing and stay mentally strong. If I can do that, it's another major my way." As for Graeme McDowell and Shane Lowry, both had their problems to fall away. Lowry had to chip out from the heavy rough at the first and bogeyed before racking up a double bogey six at the sixth, where he took four to get down from 48 yards, missing a five footer for bogey. McDowell had a perfect round bar the quadruple bogey eight he racked up by finding water twiceon the 13th in a level par 71 that left him where he started on one over while Lowry never got going and posted a 74 that left him tied for second last on three over. "I played beautiful this morning," McDowell said. "It's so disappointing to make an elementary quadruple bogey. It's a card-wrecker, a tournament-wrecker, a weekend-wrecker, all of the above." McDowell split the fairway with his drive and had 102 yards for his approach with a gap wedge to the 35-yard par-four. "It's a tough little right pin position," he said. "And the first ball, I really think it was a wet, mudball. I was trying to hit a little draw in there left of the pin and it stayed." Having hopped into the hazard with his second, he went to the drop zone and then "just hit a bad shot," back into the hazard and ended up with an eight. "Very disappointing," he said. "Otherwise, a great round." >>thx for your help!! RT @Eyesofthemaker tough break with the drop zone lie on 13. I was holding the microphone 5 feet from you. Big fan. 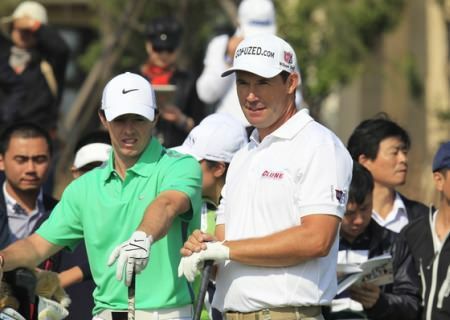 McIlroy says ankle ready; but can he beat ring rust? Rory McIlroy could have taken a longer, safer route to the 18th green at Whistling Straits. Instead he bounded down a steep hill like a mountain goat who’d just spotted a particularly juicy clump of grass.